Kathys Cluttered Mind: Favorite Photo(s) of 2011 - Really I can only pick one? Favorite Photo(s) of 2011 - Really I can only pick one? 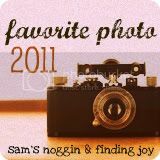 I am joining Finding Joy and Sams Noggin and linking up my favorite photo for 2011. Really just one? Do you know how many photos I take? I have an external hard drive that I keep my photos on so they are safe and sound. If there is ever a natural disaster or fire that hard drive will be the one item (besides my kids and husband) that I grab. To be exact on how many pictures I have there is 28.4 GB, 17, 745 files and 344 folders (and that doesn't even count the ones that are on disks already). My camera is practically an appendage. I am choosing 3 favorite photos: One of Rowyn, one of Gwyn and one family one. I took this picture at Llama Llama day at our library. I love that it captures Gwyns love for animals and I love the sun rays shining down on my precious angel. He is so gonna hate me when he is older for posting this. But this photo captures Rowyn so well. He is wearing his favorite color, his eyes look gorgeous as always, he has a big bruise and is picking his nose. Yup that is my sweet boy! And of course our 2011 family photo! Okay I lied I have one more. I just have to include a favorite shot of the two kids getting along and showing their love for each other. I have so many other favorites and a lot of them are on my blog (which is one reason it is so slow). I hope everyone has a wonderful new year filled with many more wonderful new memories! Picking just one is next to impossible-I love your "picks"! Thanks for joining in on the fun! I am totally laughing as I agree with you about the crazy thought of choosing one photo! Hannah has an external drive to hold all of her photos otherwise I don't think her computer would even load. Love the pics that you chose. I love this! I love the photo of Rowyn! My girls are like that too! I wish I had more time to join in--this is a fun linky! I couldn't pick just one either...love the ones you chose to share! !